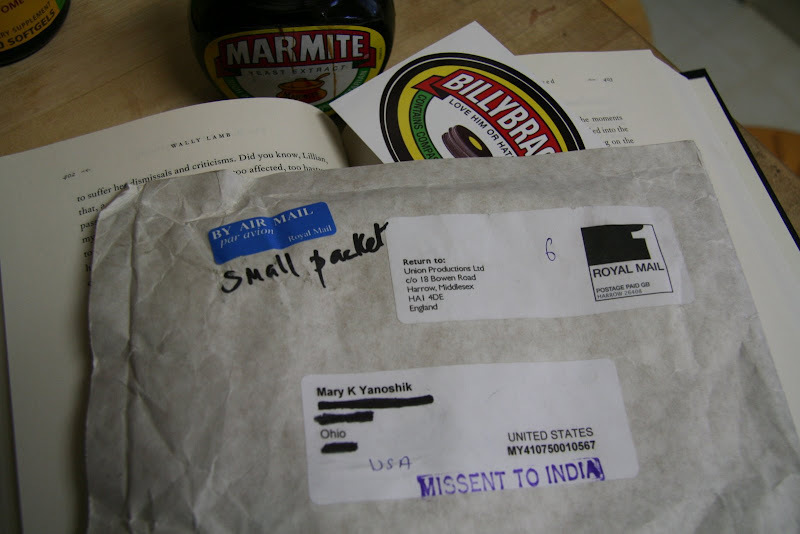 as one who loves billy and marmite, I couldn't resist ordering this. what amazes me is I placed the order on january 17th and even though the small packet was first sent to india it arrived at my house a mere ten days later. wow, it is a small world after all! hmmmm thinking of marmite, I do think it's time to make some toast for a slather. click to hear it's a small world - although I have to warn you, you will be at serious risk for an earworm. Okay, so where's the sot of thenew t-shirt? Marmite is a new one on me. I wonder if anybody in the US sells it? I know about Australia's Vegemite, and that stuff is horrible, so I may approach with caution. I've never heard of either of these! Just curious...how do you eat the Marmite and what does it taste like? roy - the shirt is being washed! to read about the difference between marmite and vegemite click here I've had both marmite and vegemite - I prefer marmite, but vegemite is okay if no marmite is around. if you find vegemite horrid, I expect you will not enjoy marmite! Ok, I can't resist. "A Package to India." And as for, "It's a Small World," I remember being in one of those tiny boats with tiny child and having the ride break down, trapping us with no way to escape. When I think of madness, the memory pops right up. Marmite always finds a way through to those who love it! the good thing about some people not liking marmite is: those who love it don't have to share it so much. First sent to India?? How odd! My sister has the 'revolution is just a t-shirt away' one. Now that's an international package! The World Is Flat was my first inkling of how well-connected the world really is. Having lived in Orlando before and during the mouse invasion, I have sat many a time on the Small World ride. I hope the "new" Disney guys leave it alone! They changed the entry exhibit to the Tiki House to a brawl between two birds. haha, billy as marmite. yeah. Is this like spam or something? Just say no to marmite. A former friend of mine tried to put it on some pizza she was making for me. No. Thanks. No wait! It was vegemite!